Who can be accepted at GWA? Any child that fulfills the admissions requirements, Nursery-12th grade. See our Considerations Per Grade page for more details. Does GWA teach 3 languages? Yes, English is the primary language, French begins in Pre-K, and Arabic in 1st grade. Does my child have to learn all 3 languages to graduate? Students need to have 4 language credits in order to graduate, this does not mean they need to be proficient in all 3 languages. Moroccan students are required to have Arabic in high school. Are there extra-curricular activities at GWA? Yes, it is called the Parent Club. It is a collection of parents who are working to better the school, through events and other opportunities. Is GWA a private school? GWA is a not-for-profit association and is a private, American school . Yes, George Washington Academy is fully accredited by the Middle States Association of Colleges and Schools (MSA). Accreditation was a four-year process that was successfully recognized and awarded by MSA with full accreditation in November 2009. GWA was fully re-accredited in 2016. See Accreditation. What universities can GWA graduates be accepted to? The short answer is all universities! The American diploma earned at GWA opens up higher education doors in universities worldwide including Morocco. GWA graduates can apply seamlessly to all American universities and colleges since we follow the exact same application process as other American high schools in the United States . High school students at GWA take American college admission tests : SAT, ACT and can earn college credits with the AP (Advanced Placement) before setting foot in college. The American diploma awarded at GWA allows graduates to pursue their higher education in universities worldwide. GWA alumni attended universities in the UK, Canada, Europe, Asia and in Africa according to their personal choices and preferences. For non American college applications, graduates will follow the application procedure of the college of their choice. See our School Profile for a non exhaustive college acceptance list. Do we provide a full lunch program? Yes, GWA offers a full lunch from Nursery through 12th grade. Kindergarten lunches are served in their classrooms. All other classes enjoy their lunches in the Multi-Purpose Room. View sample Cafeteria Menus. MPR stands for Multi-Purpose Room and is the space where the school holds lunch, assemblies, drama productions, school dances and many other GWA functions and exhibitions. We are very proud of our soccer field, it is the largest soccer field in any school in Morocco, and we take great care in providing excellent physical education using this pristine field. In high school we have one elective of World Religions, where the teacher provides an objective view on many world religions. Our campus is a gated community that is staffed by multiple guards. GWA has a security plan in place and follows a regular schedule of emergency drills. We provide a bus service for our families and the price is dependent on distance from the school. See our Bus page. 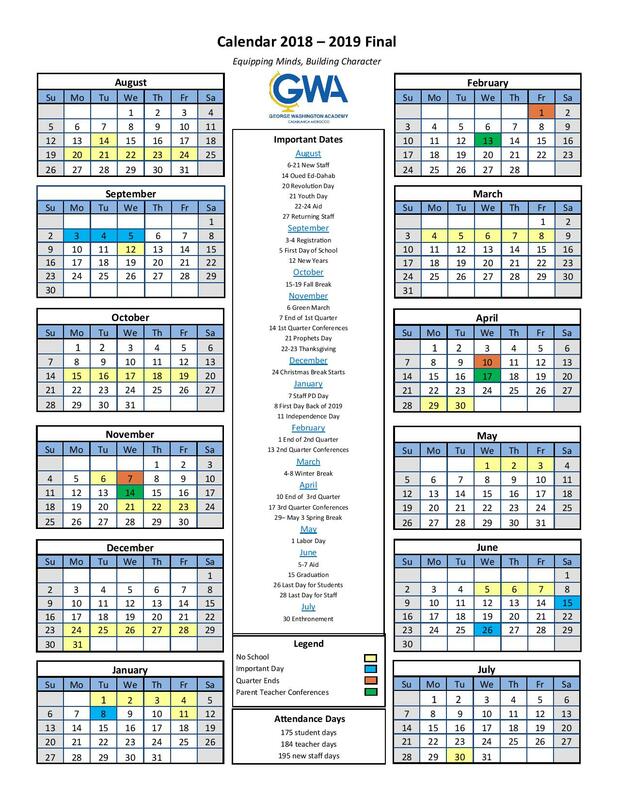 You can find the School Calendar online here. Do you have help for those with special needs? For elementary school we have a Student Support Service Team which includes ESL, reading specialists, and learning therapists. For middle school we have ESL teachers as well as school counselors. In High School there is a resource center for French and Arabic, as well as school counselors. In addition to these options we also have after school tutoring and homework club. A commitment to traditional Moroccan and American values such as respect, compassion, integrity, excellence, wisdom and faith. George Washington Academy is a not for profit school founded in 1998 by Global Education, www.global.org.ma. Today, GWA is recognized by both the Moroccan and United States governments as an accredited, American school. Our student body counts more than 900 students, from Nursery to 12th Grade. We have over 40 nationalities on campus – roughly 60% Moroccan, 20% American and 20% others. View our School Profile for more information.